Submit your entries; entry deadline March 15, 2019. For entry rules and categories, click here. The Press Club of Cleveland congratulates all the winners of the 2018 All Ohio Excellence in Journalism Awards. The awards were held on June 1, 2018 at the House of Blues in Cleveland. Congratulations to all the winners of the 2017 All Ohio Excellence in Journalism Awards! The awards ceremony was held on June 2, 2017 at the House of Blues in Cleveland. 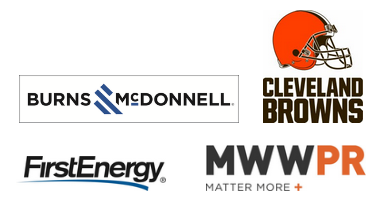 Thank you to FirstEnergy Corp. for being the Press Club's corporate sponsor; thank you to the Cleveland Browns for sponsoring the awards reception, PR Newswire for its supporting sponsorship and the House of Blues for hosting the event again. Also, thank you to Lee Moran, Press Club board member and chair of the Excellence in Journalism awards committee, as well as Press Club staffers Lynn Bracic and Debi Weslek. For the complete tab with the winners and additional information, click here. The Press Club of Cleveland congratulates all the winners of the 2016 All Ohio Excellence in Journalism Awards. The awards were held on June 3, 2016 at the House of Blues in Cleveland. Congratulations to the winners and all the nominees! A complete list of the winners, including a tab with additional information is available here. Thank you to all who made this contest possible, especially The Press Club of Cleveland EIJ event committee members Lee Moran, Carol Kovach, Dan Jacobs and Michelle Parks Lazette; and to Lynn Bracic, Debi Weslak and others who gave them support. Thanks also to the judges who are professionals affiliated with press clubs in New Orleans, Los Angeles, Omaha, Tulsa, Syracuse, San Francisco Peninsula and San Diego. Special thanks to Press Club Corporate Partners FirstEnergy and Medical Mutual of Ohio for their support, and to event’s presenting sponsor, House of Blues. A complete list of winners for the 2014 Excellence in Journalism Awards is available here. Congratulations to all the nominees and winners of Press Club of Cleveland's Ohio 2013 Excellence in Journalism awards. Complete list of winners available here. The Press Club of Cleveland congratulates all of the winners of the 34th annual Ohio Excellence in Journalism Awards. To search for Press Club of Cleveland Excellence in Journalism award recipients from 2006 through 2011, please visit the Excellence in Journalism Awards Archives. Highlights of the 30th Anniversary of the event. 2006 Excellence in Journalism complete list of winners.